Ladies need other ladies. It's a fact. We are just social beings in need of connections. It's how God wired us and it's good. But sometimes, even in a church full of lovely women, we can feel lonely. It was mulling over this feeling of loneliness and non-connectedness that led me and two of my most beloved womenfolk (MIL (mother-in-law) and SIL (sister-in-law), to be exact), to brainstorm how to battle this feeling within the church, specifically, our church. We wanted an event that could bring women together and allow them to get to know each other individually and feel personally connected to many other women in the church. It was a tall order. My SIL basically said we needed an event that would "force" (in a nice way ;) women to talk to each other so they wouldn't just gravitate to their own friend groups per usual. Something to make people talk to each other one-on-one. After the initial laugh from my MIL and SIL they thought a bit more. It could work! But it would be called ... Speed Friending. 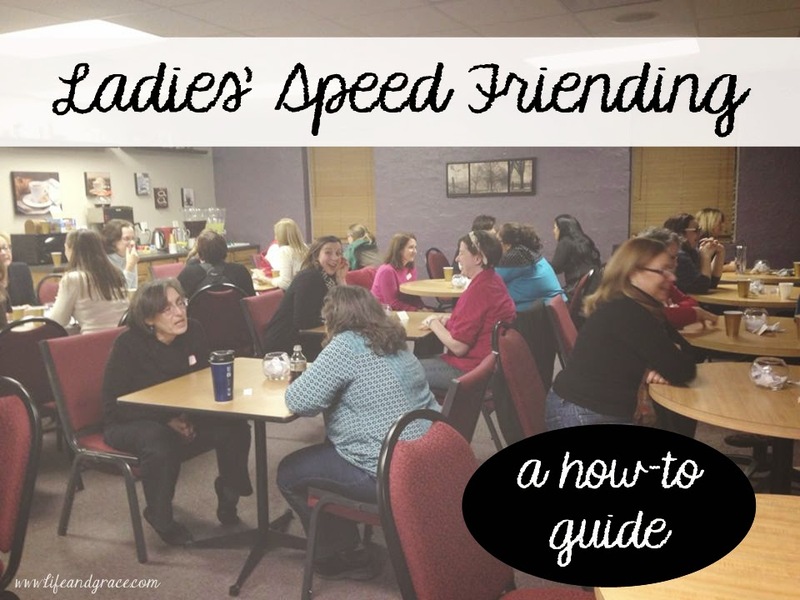 And then my SIL came up with the best title for this never before done event ... New Year, New Friends: Ladies' Speed Friending. On one half of the room, set up chairs in a circle. You need one less chair than people (kind of like musical chairs). So if you have 30 ladies, only setup 29 chairs. On the other half, setup one on one tables. Number the tables 1 through (?) however many you need. In the center of each table, place a fishbowl (something people can stick their hands into) with slips of paper (conversation questions all cut up). We purchased the fishbowls at the Dollar Store. We also had a welcome table setup with sticky blank name tags and a sheet for people to write their name and phone number, which we gave out at the end of the night. We also had a snack table (we asked all who came to bring an hors d'oeuvre to share), and an area for hot and cold drinks. I just asked our ministry team to not bring a snack but a drink instead. We started the event at around 7:15. We played the first game for about 30 min. Then we broke for snacks for another 30 min. Then we did the speed friending, which took about 45. When that was over we invited people to stay and chat or leave if they needed to. This was the first game, the one with the circle of chairs. Everyone takes a seat with one lady standing in the middle. She makes a statement like ... "Anyone who wears contacts!" If you wear contacts then you must get up and switch chairs. You may not sit in the chair next to you, it has to be at least 2 chairs away. Eventually, after everyone scrambles for a new chair, there will be one woman standing. She's "it" and has to think of a new description. These descriptions can be thought of randomly but to help people out, we had a white board with several question suggestions on there. In the event that a person can't think of something, the can shout "Mutiny!" and the whole circle must find a new chair. Everyone sits down at a table, one-on-one. The hostess starts a timer and you get two minutes to talk to the person in front of you. You can use the questions in the fishbowl as startup conversation pieces, but we encouraged women to not try to fly through the questions but to use them as jumping off points. At the end of two minutes, those facing the back wall switched to the next consecutive table and the others stayed seated. This continues until you're back with the person you started with. There is one slight problem with this that we didn't foresee until that night - since half the group moves and half the group stays put, those within each group never get to talk to one another. No one seemed to mind though and it just made us think we need another event like this!! So there you have it: Ladies' Speed Friending. I hope it proves to be a wonderful night of connecting with the women in your sphere of acquaintance. And please stop back here and let me know how it goes!! What do you think? Does this sound like something you'd enjoy? What questions might you ask? Have you ever gone actual speed dating? Great evening of fun. Looking forward to the next one. This is an awesome idea! I am bookmarking it to remember it as a future ladies event. Right now, we are about to have a "mini-retreat" but we have talked about an evening autumn event, and this sounds perfect! Thank you! I am a Pastor and we have been brainstorming creative events for our Ladies to get to know each other. We had thought about the concept of speed dating as a launching point, but then I found this article. Thanks for leading the way. I would love to see the set of questions you used.